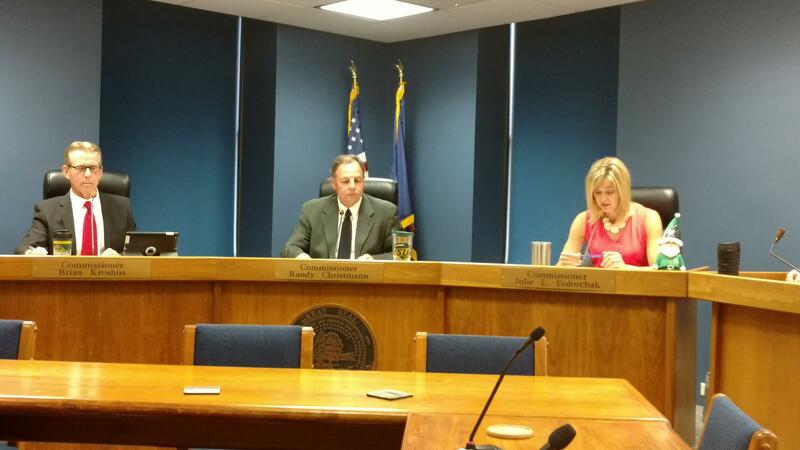 Public Service Commissioners Brian Kroshus (l), Randy Christmann and Julie Fedorchak (6-30-17). Commissioner Julie Fedorchak said Xcel has been working to replace some “unjacketed cable” that may be the problem with many of the outages. She said she hopes once that project is finished, reliability will improve. "And they (Xcel) have really invested a lot into trying to improve the reliability," Fedorchak said. "They recognize it is an issue, and continues to be an issue." Fedorchak said she's heard from a number of customers frustrated with the outages. Commissioner Brian Kroshus said Xcel has also discovered that when city salt trucks are out to take care of ice, the salt splashes on wooden power poles. Kroshus said it interacts with the chemical treatment on those poles, causing the poles to catch fire. The Public Service Commission has reached what it’s calling a comprehensive settlement with Xcel Energy over a number of issues. And the PSC says the bottom line is: Customers will see a refund on their monthly bills, and Xcel will freeze its electric rates until 2017.